When I’m faced with the choice of whether to eat in or out, it’s usually eating in that wins. 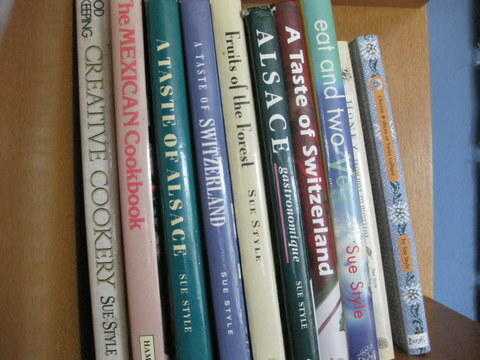 I love poring over books, planning a meal (maybe testing out something for an upcoming workshop), buying it (especially if this includes a visit to Saint Louis or Loerrach market), cooking it up in my azure-blue Alsace kitchen and enjoying it in the comfort of my own home – with wines selected from our own cellar. I even have a SO who takes care of the bits of washing up that won’t go in the dishwasher. What’s not to like? But I’m also partial to a bit of eating out, of which I do more than my fair share during the year. There are always highs and inevitably some lows (even some absolute horrors). Here’s a roundup of places visited in the past year or so. I’ll post it in at least two episodes, otherwise you’ll get indigestion. In Amsterdam we loved the oddly named Ron Gastrobar, a big, buzzy bistro full of local foodies, mainly half our age. The food is full-on tapas/bites/snacking mode and every dish (a decent racion rather than tapas-size) costs €15. 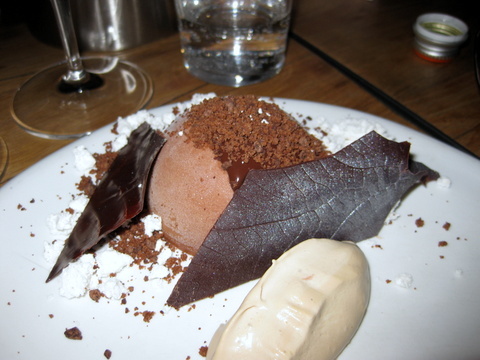 Stars included crab mash with foam, intensely flavoured and wholly nourishing for taste buds and the soul, a ‘Dutch sausage roll’, aka hare in a royale sauce with foie gras wrapped in pastry, and a naughty choc ice, slightly redeemed by a yogurt mousse. In Maastricht we came a cropper at Gio’s Cucina Casalinga. You can’t book but you leave a mobile number and they call you when a table frees up. You arrive and (if lucky) you’re seated. After a long pause, a waitress appears asking if you’d like a drink. “Love one”, you reply. “Wine?” she asks. “Sure, what do you have?” “We have the house white and the house red.” “Yes, and what are they?” “Italian.” “Yes, and from where in Italy?” This is becoming tiresome, but we try again. “May we see the bottle?” Bottles are grudgingly procured, one of each colour. The bianco is a verdicchio from somewhere, the rosso is from somewhere else, probably somewhere south of the white. We go with some of each. Long pause. After about 30 minutes, with zero interest from the wait staff and no sign of a menu, we’re beginning to wonder if they also serve food. A signora (Gio?) hoves into view. Reluctantly, very reluctantly, she divulges the fact that YES, they do food, and there is a menu, and today it will be tomato/mozza, followed by ravioli followed by a) lamb or b) beef or c) shellfish and it will cost €37. The meal began eventually at 8.30 p.m. and we got out at around 11 p.m. Getting each course was like prising blood from a stone. By the time it arrived, hunger had evaporated, boredom and irritation had set in and all we wanted was to go home and curl up in bed with a hot-water bottle or a sarnie or ANYTHING. 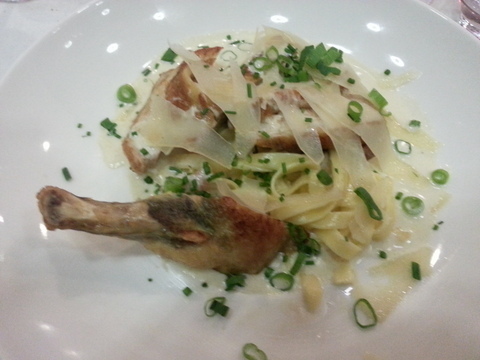 The bill for 3 with the house bianco and rosso was €176; the soggy profiteroles were extra. La Bistronomie in Illzach (nether regions of Mulhouse/Alsace) is the tapas end of the gourmet resto La Closerie, housed in a light, bright conservatory-style building and open evenings only. For between €25 and €30 you get a 2- or 3-course menu; add in €18 for 3 different glasses of wine (a white from Friuli, a white Cairanne and a Chianti Classico in our case, all interesting and different). Food included “cannelloni” of marinated tuna where pasta was replaced with a rice wrapper, a robust, wintery pressée de queue de boeuf (pressed, jellied oxtail), perfectly done cod with langoustine sauce and overcooked risotto, and guineal fowl “carbonara” with a creamy smoky sauce. 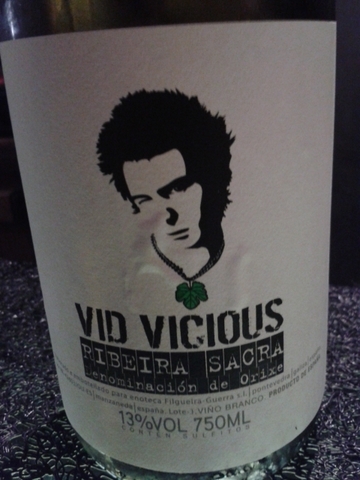 Service was cheerful and the open wines are a definite plus. 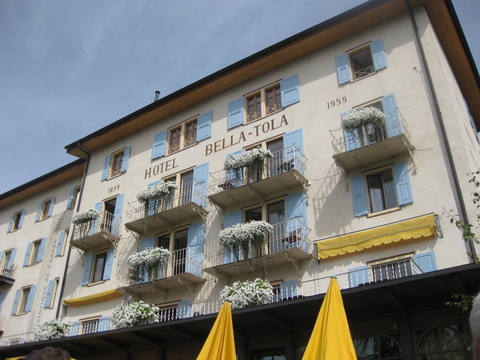 Hotel Bella Tola on a sunny plateau high above Sierre in the Valais/Switzerland, built originally in 1859 and member of Historic Swiss Hotels, is a delicious haven both in summer and winter. Food is fairly standard Swiss fare (lamb’s lettuce salad, veal, risotto & Co.); the real draw is their spectacular wine list, a veritable litany of Valaisan wines (Arvine, Chardonnay, Fendant, Ermitage, Johannisberg, Heida, Humagne (white and red), Lafnetscha, Malvoisie, Rèze, Cornalin, Diolinoir, Dole, Gamaret, Merlot, Syrah & more) from all the leading producers. 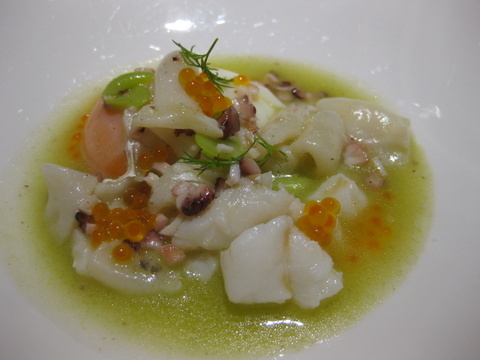 Galicia/northwest Spain (research for a wine travel piece for Decanter, due out in March) was a high point and provided some of the year’s most outrageously good eating and drinking. I put away close to my own weight in zamburiñas (queen scallops), discovered fragrant and fleshy Treixadura (Rubens to Albariño’s Twiggy), and fell in love with the local smoked San Simon cheese. Too many places to list, but in A Coruna I’d go back in a heartbeat to Vinoteca Jaleo for their spectacular shellfish tapas (langostinos, pulpo, scallops large and small) and the [omi]Godello Bolo from Rafael Palacios. Both Restaurante Nova in Ourense (I squeaked in just before the two young chefs Daniel Guzmán and Julio Sotomayor announced their first Michelin star, a development which I wholeheartedly approve) and Restaurante Yayo Daporta in Cambados (Yayo is part of the Top Chef team on Spanish TV) stole the show with their inspired nueva cocina gallega. In Santiago de Compostela I can’t wait to return to Abastos 2.0 for their 5-tapas menu @ €21 (razor clams with jellied juices, cured mackerel with wasabi, empanada of bonito, cuttlefish with an inky mash and a softly poached egg with chorizo crumbs) washed down with a wicked Godello that goes by the name of Vid Vicious (vid = vine). Perch on a stool, soak up the super ambiente, watch the chefs beetling from one side of the street to the other (where the second restaurant is), brandishing plates of food you kind of wish you’d ordered but will go back for next time. On the other hand I definitely won’t bother with Acio, where the food was good enough and the wine list well furnished but the people startlingly shirty. Interested, as ever, in the wine list (not least for the Decanter article), I was making a few notes of wine producers worth visiting, to be instructed frostily by the sommelier: “Please do NOT copy our wine list”. Phew, that’s enough for now; next time around we’ll visit Mallorca, Emporda/Catalunya, Umbria, Sicily, Baden/Germany and the Jura (another Decanter piece, just published in the February issue).